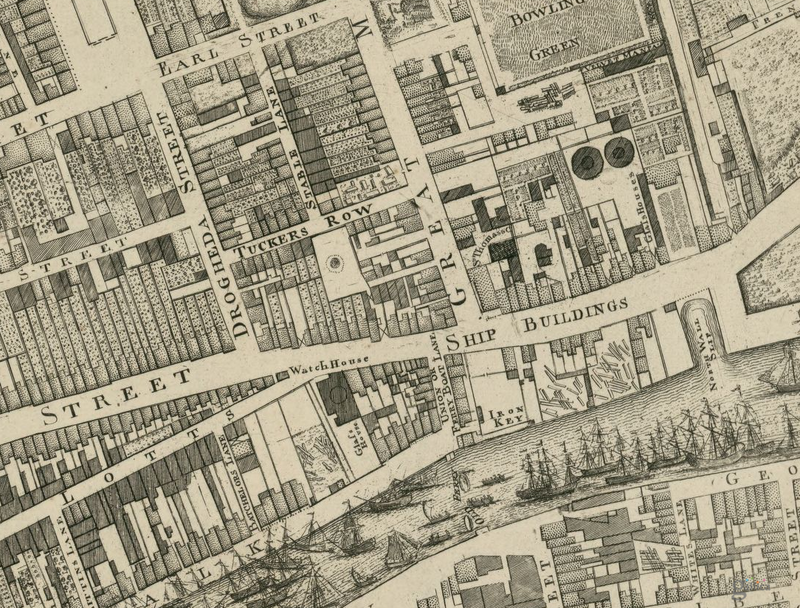 A Grand Tour tour, Rutland Square to Sail ships & across the River. 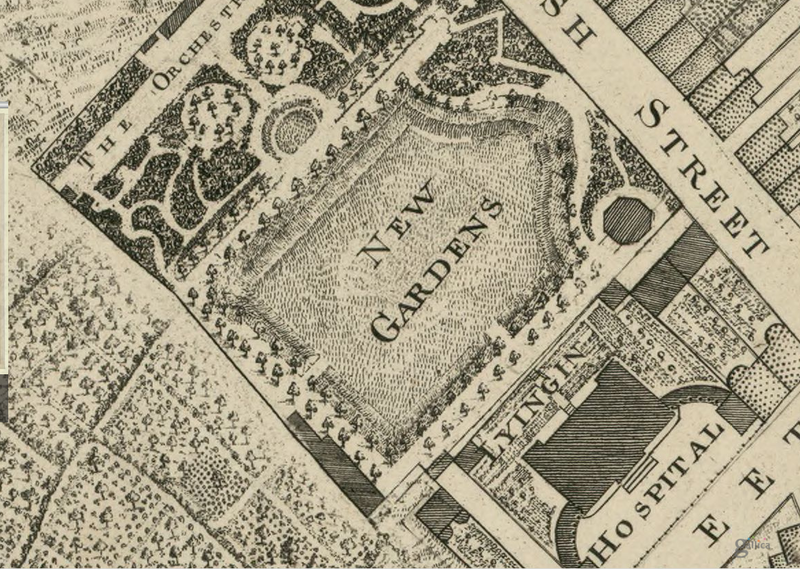 As you see on the below map by that Huguenot genius John Roque, Parnell (Rutland) Square in 1756 was hardly laid out with any buildings. 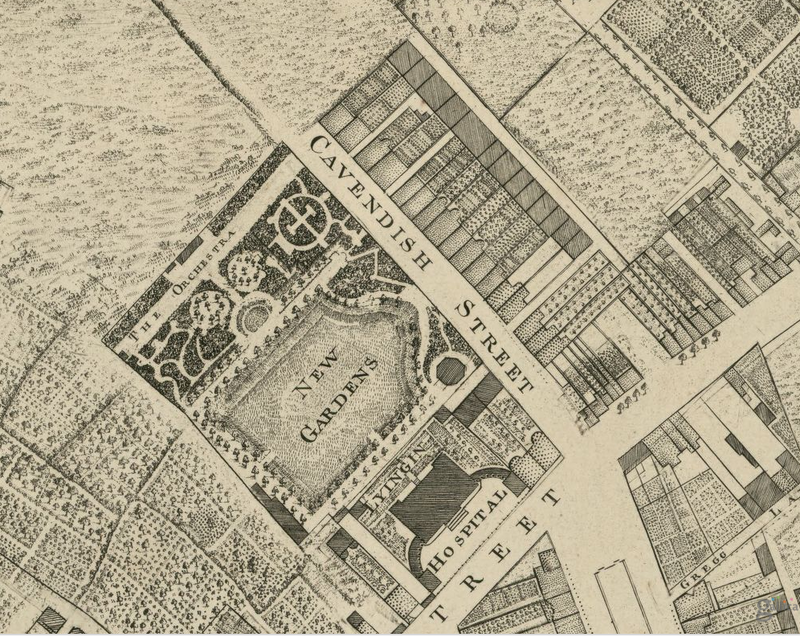 The famous Lying In Hospital (Rotunda) had been founded by Dr Bartholomew Moss was there (built by Richard Cassels) was there, and Cavendish Row/Street itself. and not much else. Immediately south of the Hospital, a very grand boulevard, Sackville Mall, the dream child of Luke Gardiner the elder is already laid out. 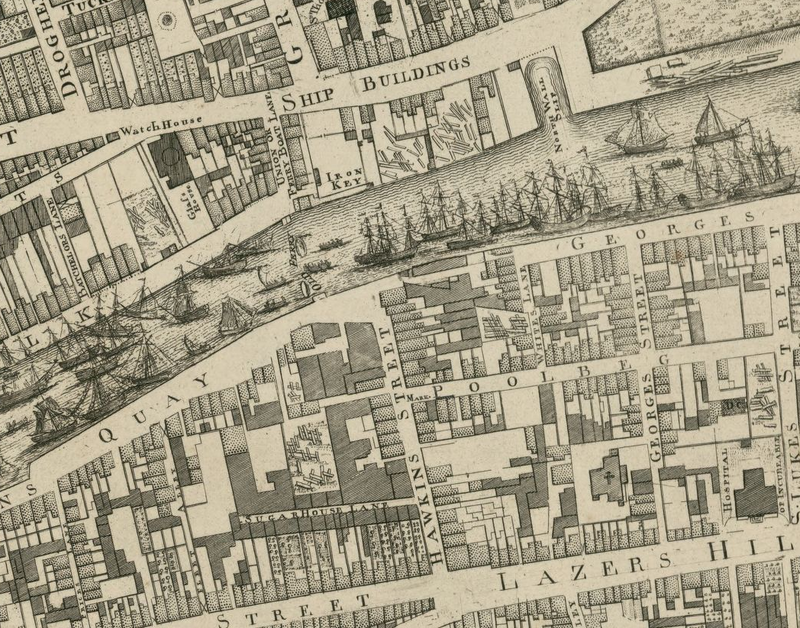 But it only runs for about half the length of modern day O’Connell’s st. A much smaller street, Drogheda Street then ran the rest of the length, running southwards towards the Liffey, but even this didn’t connect properly with the Liffey, as you can see in this picture below. Instead, at the bottom south end of Drogeda Street, a clutter of street junctions – South Lotts, and Great Abbey St, (which Roque has spelt “Abby”) and various plots, shops, dwellings and warehouses, all block access to the river. Perhaps it doesn’t matter anyway, because modern-day O’Connells Bridge, or even Carlisle Bridge, (to give it its former name) also doesn’t exist yet. Looking back up to the top left (NE) of this map, you’ll see Great Marlborough Street (only “Great M..” visible here). Tyrone House, (also Richard Cassels) isn’t built yet. Nor, obviously, is the Pro-Cathedral. But the vital, all-important Bowling Green is there! Looking at this map always pleases and fascinates me though. You have to admire Roque’s ships. They are beautiful. Look at the little Watch House too, on Ship Buildings (street) and between that lane and the river, look at the little lumber yards. These presumably are shipwrights yard for repair of those sailboats. The timbers there are located between “Iron Key” and the North Wall Slip. That’s “key”, not “quay” interestingly, although quay is of course the word Roques uses elsewhere along the river. It is all most intriguing. I wonder what the Iron Key was? One is tempted to think Iron workers, making iron parts for the ships. 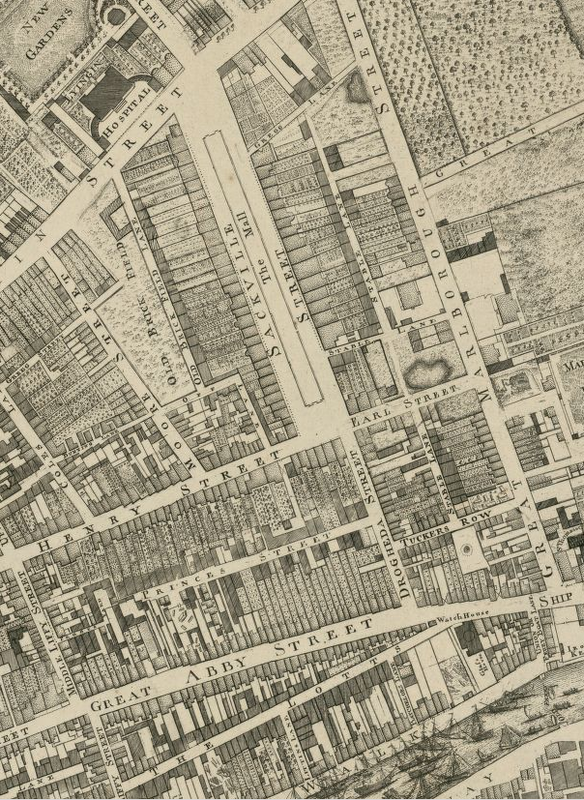 Going to the very bottom (S) of this frame, Lazars Hill is of course now Pearse St. It was clearly Lazars Hill before it was Brunswick Street, before it was changed again to Pearse St. In the old world of Templar and Hospitallers and early health care, and in medieval Christendom generally, the word Lazars and Lazarus (and St Stephen) generally referred to leprosy and its treatment. The ancient hospital in this area however, was once known as St James. But that’s not so surprising either, when you think of it. Back in medieval era, many of the people making their way down to quays and the river here would have been traveling on pilgrimage, many of them to Santiago de Compestella. To the shrine of St James. These pilgrims often got sick along the way, and religious orders would look after them. They also had their pilgrims passports stamped along the way. The Dublin stamp was collected, a mile or so to the west of here. At St James Gate. Why Lazars ‘Hill’ Arran? It’s flat as a pancake isn’t it? Yes, Marlborough Street is pretty crummy but I used to enjoy a stroll up there towards Dorset Street and it’s clearly seen better times. It was clearly the main drag down to the river in those days. Indeed it was. And clearly much grander, with Lord Tyrone siting his house there, etc. Now however its a very sad and shabby spectacle, grim, dirty and windblown. Breaks my heart. Emer, I did indeed respond, but I could only respond under your comment on my blog, since you did not provide an email address, nor details of the event, i noticed! :)) Send me your email address this time, and I’ll send you a link to Roque’s map, Best- Arran. Previous Post changed utterly: Dublin’s Streets and Mrs Peg Leeson. Next Post North Georgian Dublin: Historic Walking Tour, 2pm Sunday 22 March.